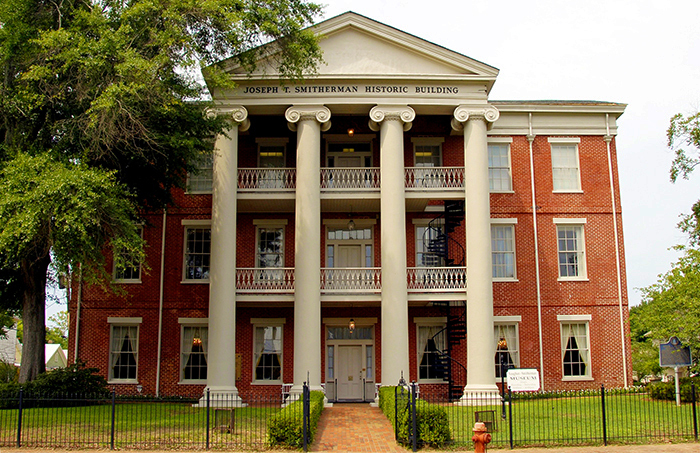 The Joseph T. Smitherman Historic Building in Selma, Dallas County, was built in 1847 as the Central Masonic Institute, a school for orphaned or abandoned children of its members. Over its lifetime, it has served as a Confederate and Freedman's Bureau hospital, the Dallas County Courthouse, a military school, and finally Vaughan Memorial Hospital from 1911 to 1960. The city purchased the building in 1969, during the tenure of Mayor Joseph T. Smitherman, and it was named for him. It houses the Vaughan-Smitherman Museum of Selma history and was listed on the National Register of Historic Places in 1975.